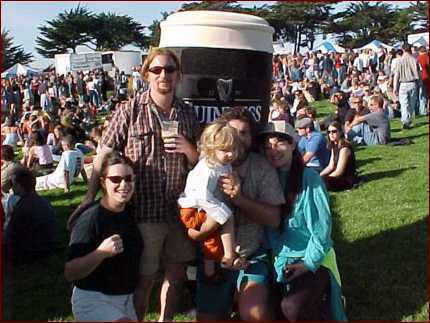 [left to right] Felicia (my sister), Adam (her husband), Isaac, me, and Rose at the Guinness Day concert at Fort Point, San Francisco, on 21 October 2000. Fel, Adam, and seven-month-old Ziggy bought a house in Alameda. We had the honor to visit the new digs on the morning of Saturday 28 June 2002, the day after they got the keys.